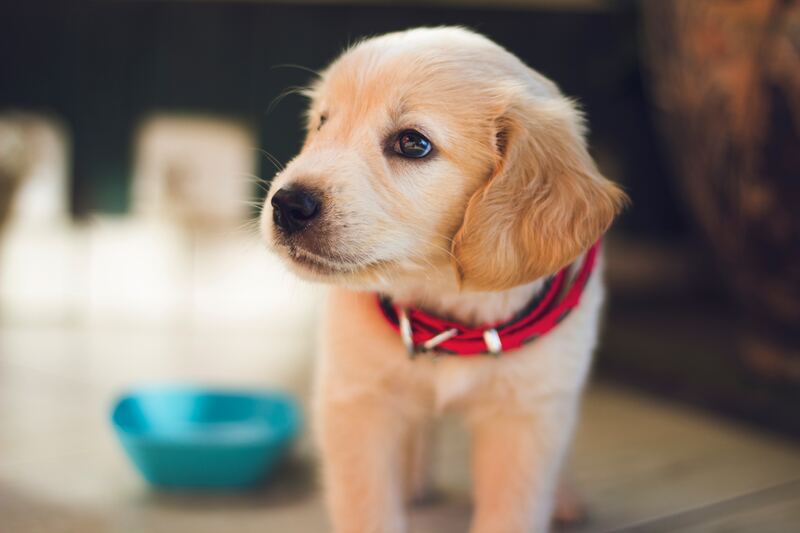 Generous funding from the UK’s largest dog charity – Dogs Trust has enabled researchers from Dogs Trust and the University of Bristol to set up and launch ‘Generation Pup’. Generation Pup is a ‘birth cohort study’, like the well-known ‘Children of the 90’s’ study, which has had a massive impact on knowledge about child development, health and disease, and informed many aspects of public health policy. Generation Pup aims to do the same – but for all breeds and crossbreeds of dogs and has the potential to be the largest study of our canine companions of this generation. Many important welfare conditions in dogs, such as epilepsy, diabetes and behaviour problems are influenced by multiple factors. Data about dogs enrolled on the Generation Pup study will be gathered using owner-completed questionnaires. In addition, owners, if they wish, can also grant the research team access to veterinary records, provide samples (e.g. faeces/hair/skin swabs) from their dogs, and/or take health cards to their vet for completion at routine visits. Generation Pup has the great advantage of collecting information about dogs as they move through their lives from ‘puppyhood’ to old age– so the ages at which diseases occur and which factors might have contributed to their development can be identified. This means that researchers in the Generation Pup team can investigate whether aspects such as environment, social interaction, diet, exercise or daily routine may be important in the development of a range of health and behaviour conditions which impact on the well-being of our dogs. Knowledge of important risk factors can be used to develop strategies to reduce the likelihood of associated diseases and behavioural problems affecting dogs in the future. In order that we can gather enough information to conduct robust statistical analysis to make a real difference to dog welfare, we aim to recruit 10,000 puppies to the study from anywhere in the UK. Puppy owner participation is crucial for the success of the study. Can I register my puppy? Yes please!! As long as you live in the UK and your puppy is still under 16 weeks of age at the time of registration. 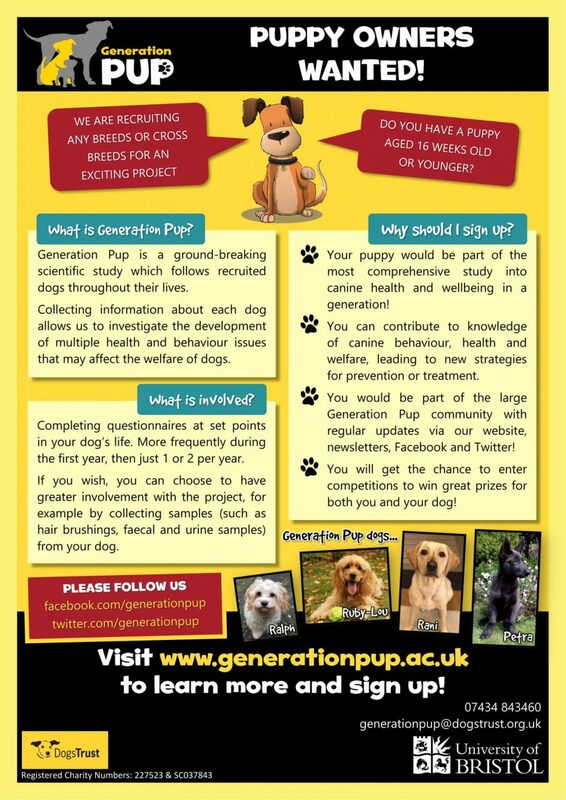 Visit www.generationpup.ac.uk to find out more and sign up..
Can I help you recruit puppy owners? Yes please!! We are using a variety of strategies to recruit puppy owners, including magazine articles such as this, social media (on Facebook at www.facebook.com/generationpup or Twitter via www.twitter.com/generationpup) as well as help from dog breeders, rehoming centre staff, dog trainers, behaviourists, veterinary professionals, dog groomers and those running boarding kennels – anyone who comes across puppy owners! If you are able to help publicise Generation Pup through displaying our A4 posters and/or passing on our A5 flyers to puppy owners then please get in touch and we can send you our publicity material. If you would like to find out more or request a recruitment pack, please visit www.generationpup.ac.uk or get in touch with a member of our team at [email protected], or by phoning 07434 843460. At the beginning of 2018, 740 puppies had been registered with Generation Pup. With your assistance, we hope to reach 3000 by the end of 2018.